Last year, I was able to drive cross country from Connecticut to Oregon and back again. I have been asked a number of times to recommend an area to visit. My answer is usually the Grand Circle of the American Southwest. Why? There is something for everyone in this area that encompasses large portions of four states (Arizona, New Mexico, Colorado and Utah). The Grand Circle contains 10 National Parks that will blow you away. From the Cave Dwellings of Mesa Verde to the vastness of the Grand Canyon, visitors can pick and choose from quite a few types of geological marvels. Arches, canyons, rivers, lakes, canyons, hoodoos, buttes and many more dot the landscapes. 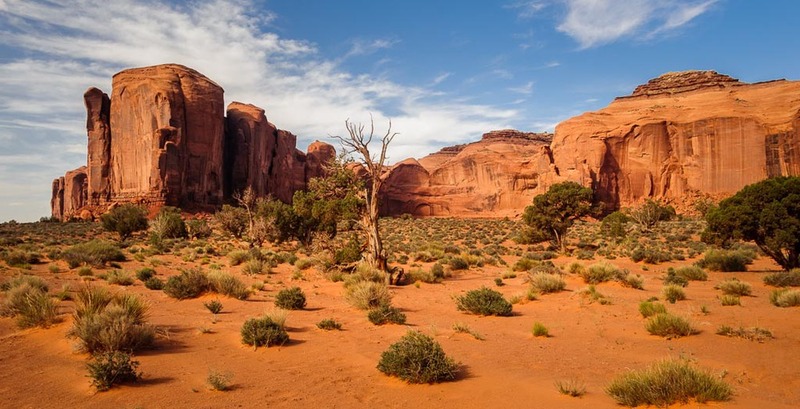 When you include the 31 state parks and the wonders of the Navajo Nation, such as Monument Valley, shown in this photo, it is quite a challenge to figure out which ones to visit first. The one thing that is consistent with all of the sights in the Grand Circle are the great colors of the sandstone and formations that might remind imaginative people of Mars.